FRITTATA ALLE CIPOLLE. I think I am starting to have allucinations. The sun has disapppeared for so long that I try to reproduce it with colors and words. A frittata seems to be the brightest thing I can get in my kitchen during this bleak February. Please note: this is an uber-simple recipe. At the same time is squidgingly delicious and delicate. Therefore, it has rules. Good organic eggs, real Parmesan, slow cooking. Cook it quickly with cheap eggs and fried onions and you get…well… scrambled eggs with onions. Not the same. Clean the spring onions removing the tough part of the green stems, then slice thinly. In a covered skillet, over low fire, soften onions in couple of tablespoon EVO oil until tender and slightly caramelized. Beat the eggs with the cheese and milk, season. Add the softened onions and, if time allows, let them soak in the egg mixture for 15 min. Warm a tablespoon of olive oil in a non-stick frying pan. The pan has to be the smallest possible to hold the egg mixture so that the frittata will be at least 1.5 cm / 2/3 of an inch thick. Add the egg mixture, cover and cook over very low heat until the frittata is almost set. At this point use the lid to ﬂip the frittata upside down and slide it back into the frying pan. Cook for a further few minutes until dry. Serve warm or at room temperature. Sounds like I have my lunch sorted out for tomorrow now! Thanks Letizia! Delicious. Plenty variations possible. Try artichokes! 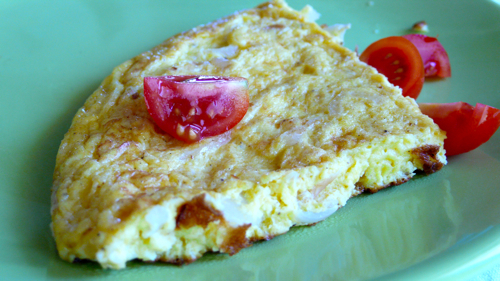 Great recipe, I think we made a similar frittata in one of your cooking classes. It was a wonderful appetizer! oh my this is gorgeous! love the picture. and the food needs to be here on my plate! Ciao Claudia, grazie! Ciao Sandra, yes, this was the frittata we made during the last cooking class you attend. It’s good to know you will be here again in a few months! Sounds like a nice bright change from all the winter foods we’ve all been making…..thanks so much Letizia! Thank you Lisa, I must say I also have enough of winter food. Today I went to the supermarket I could not even stand all those cabbages. Enough!